1 Peter Kosta (University of Potsdam) & Anton Zimmerling (Moscow University for the Humanities) Slavic clitic systems in a typological perspective. 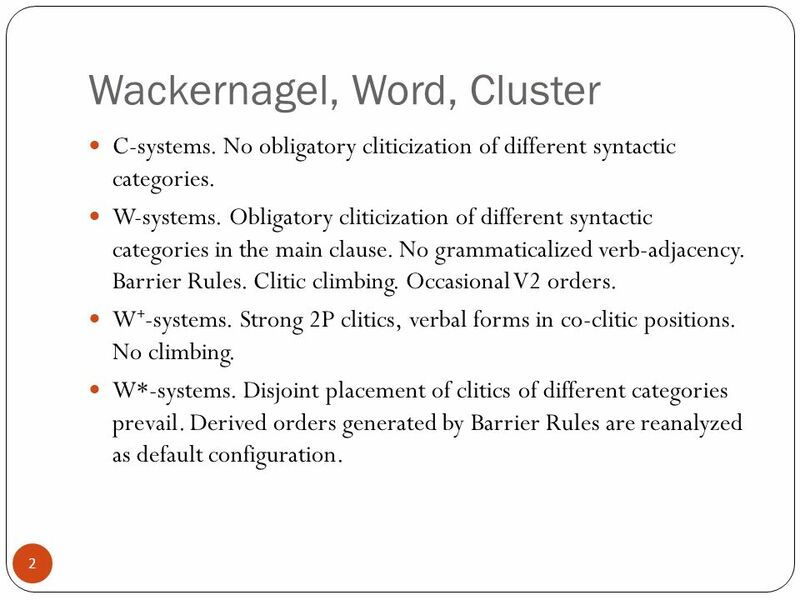 2 2 Wackernagel, Word, Cluster C-systems. No obligatory cliticization of different syntactic categories. W-systems. Obligatory cliticization of different syntactic categories in the main clause. No grammaticalized verb-adjacency. Barrier Rules. Clitic climbing. Occasional V2 orders. W + -systems. 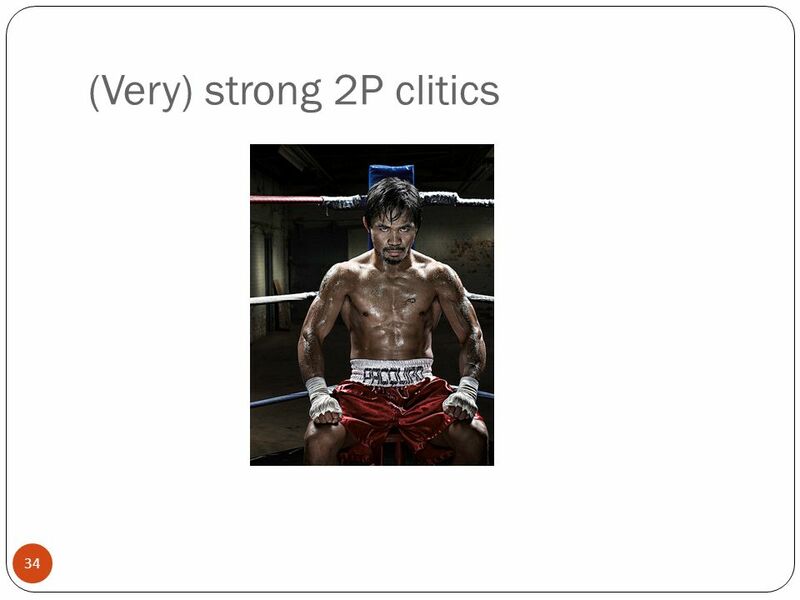 Strong 2P clitics, verbal forms in co-clitic positions. No climbing. W*-systems. Disjoint placement of clitics of different categories prevail. Derived orders generated by Barrier Rules are reanalyzed as default configuration. 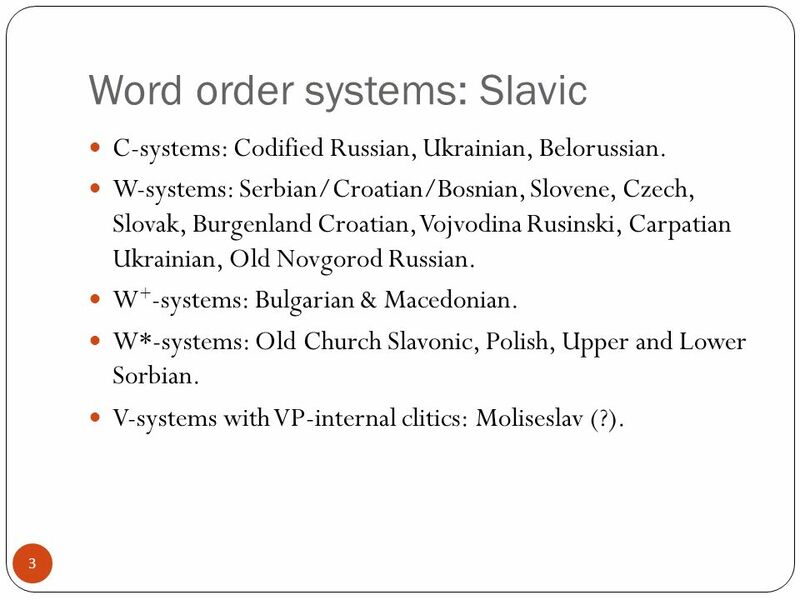 3 3 Word order systems: Slavic C-systems: Codified Russian, Ukrainian, Belorussian. W-systems: Serbian/Croatian/Bosnian, Slovene, Czech, Slovak, Burgenland Croatian, Vojvodina Rusinski, Carpatian Ukrainian, Old Novgorod Russian. W + -systems: Bulgarian & Macedonian. W*-systems: Old Church Slavonic, Polish, Upper and Lower Sorbian. V-systems with VP-internal clitics: Moliseslav (?). 4 4 Non-syntactic features and cross- linguistic variation. Orientation towards a clitic host: strict proclitics, universal clitics, strict enclitics. 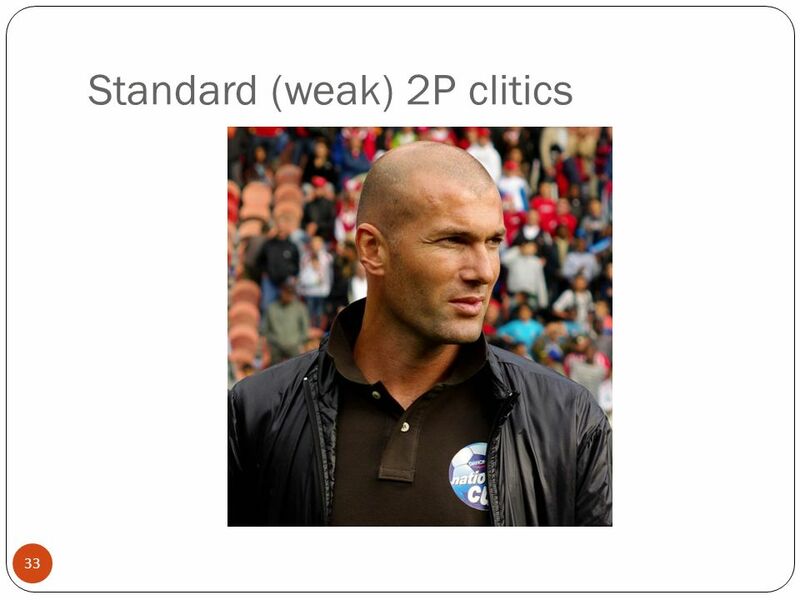 Strict 2P enclitics: clitic excluded from clausal left edge. Serbian/Croatian/Bosnian, Bulgarian, ONR, Carpatian Ukrainian. Universal clitics: clitics permitted at the clausal left edge. Macedonian, Slovene, Czech, Old Czech. 6 6 Clitic clusters: definition A cluster or a clitic group is a string of deficient elements taking contact position in a rigid order. This parameter is known as Ranking Rule or Clitic Template. Ranking Rule predicts that any two clitics a and b belonging to cluster CL are linearized in one and just one order when they take contact position [ CL …a, b…], but it does not predict that elements a and b should necessarily take contact position when both of them are present in the same clause. 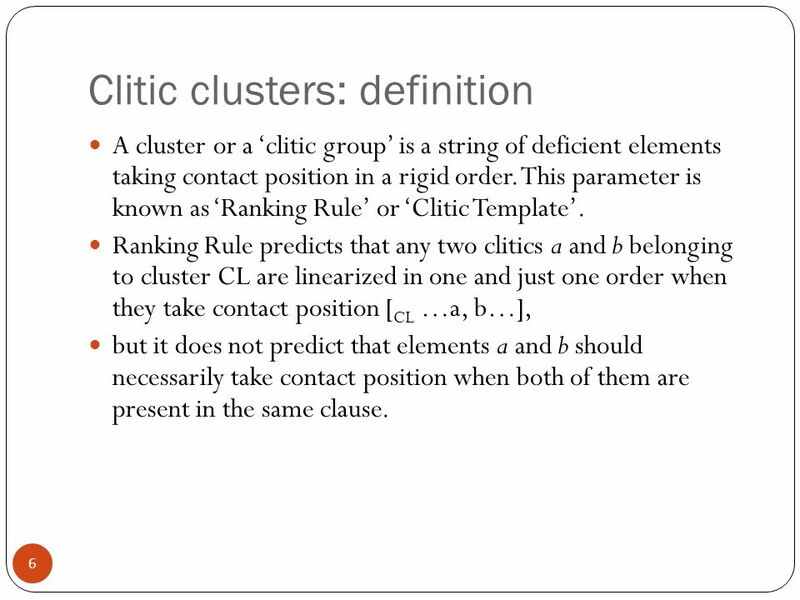 7 7 Clusters: discussion No language with a Ranking Rule completely excludes disjoint placement of those clitics that make up clitic clusters in other configurations. Clitic clusters do not exist as syntactic units, cf. (Boškovi ć 2002)? An alternative: splitting of clusters is a syntactic phenomenon: split placement of clitics does not contradict Ranking Rules if split configurations can be proven to be derived from configurations with contact positioning of clitics. 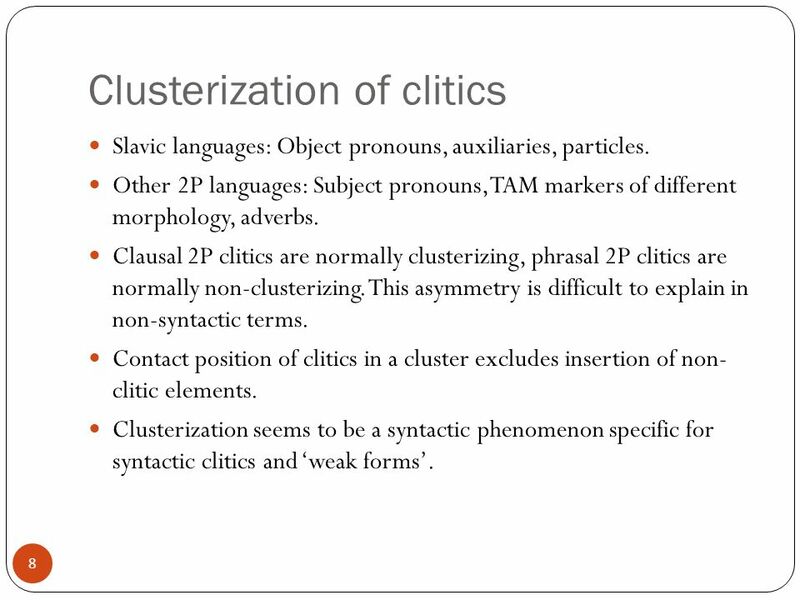 8 8 Clusterization of clitics Slavic languages: Object pronouns, auxiliaries, particles. Other 2P languages: Subject pronouns, TAM markers of different morphology, adverbs. Clausal 2P clitics are normally clusterizing, phrasal 2P clitics are normally non-clusterizing. This asymmetry is difficult to explain in non-syntactic terms. Contact position of clitics in a cluster excludes insertion of non- clitic elements. Clusterization seems to be a syntactic phenomenon specific for syntactic clitics and weak forms. 9 9 Clusterization (2) Crosslinguistically, one and the same material element can be used both as a clausal and phrasal clitic and be clusterizing in the first case and non-clusterizing in the second case. This is attested, e.g. in Ossetic and some Arawak languages. No non-syntactic factors can explain why a 2P element is clusterizing in one case and non-clusterizing in the other case. 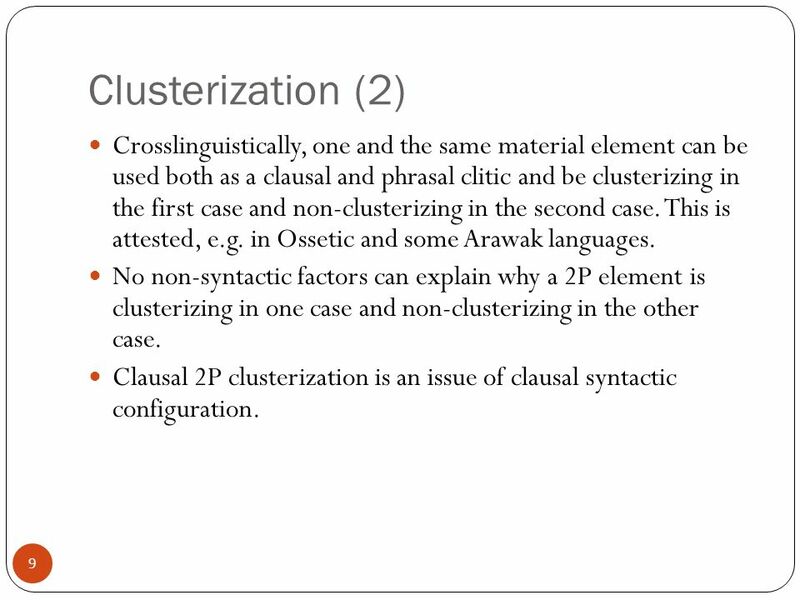 Clausal 2P clusterization is an issue of clausal syntactic configuration. 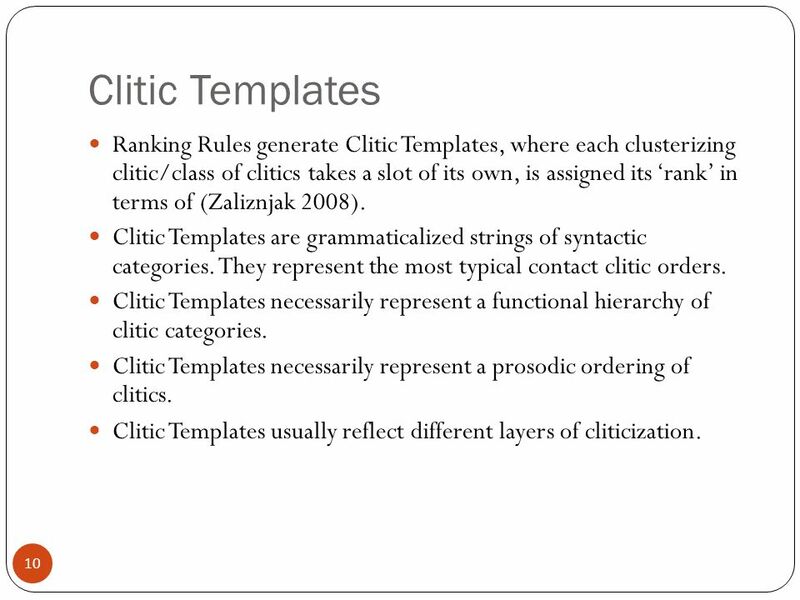 10 10 Clitic Templates Ranking Rules generate Clitic Templates, where each clusterizing clitic/class of clitics takes a slot of its own, is assigned its rank in terms of (Zaliznjak 2008). Clitic Templates are grammaticalized strings of syntactic categories. They represent the most typical contact clitic orders. Clitic Templates necessarily represent a functional hierarchy of clitic categories. Clitic Templates necessarily represent a prosodic ordering of clitics. Clitic Templates usually reflect different layers of cliticization. 11 11 Diachronical principle of ordering In 2P languages, 2P clusters *always* represent clitics of different categories. 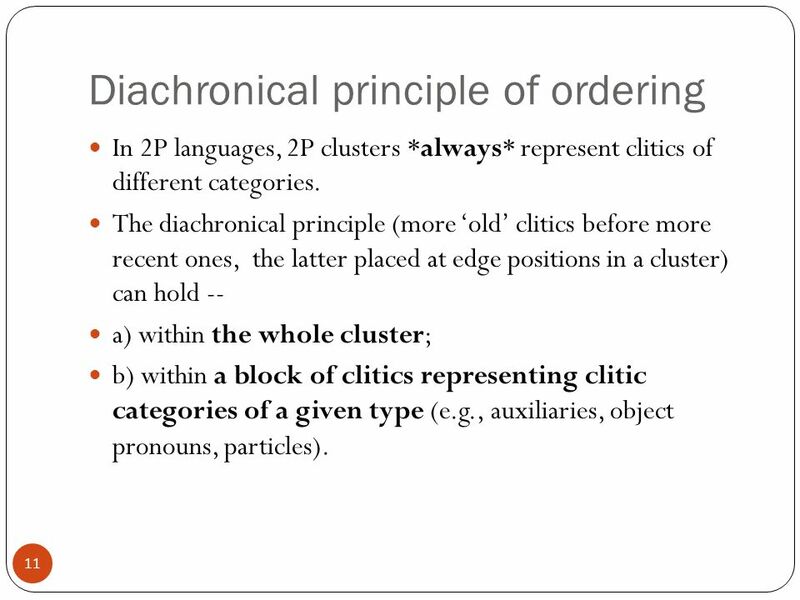 The diachronical principle (more old clitics before more recent ones, the latter placed at edge positions in a cluster) can hold -- a) within the whole cluster; b) within a block of clitics representing clitic categories of a given type (e.g., auxiliaries, object pronouns, particles). 12 12 Split clitic systems If elements representing different grammemes of the same category have been cliticized in different periods, the more recent clitics may A) take a different slot and adjoin to the already existing string of clitics. This gives rise to split clitic systems. B) Take the same slot (a rare but occasionally attested option). 14 14 Clusterization and the placement of 2P particles A) All fixed clitic particles are grouped in the left edge of the cluster. An option typical for languages, where clitic particles are older than other 2P clitics. B) Clitic particles take both the left and the right edge of the cluster. This option is typical for languages, which added new layers of clitics. C) Deictic clitics take a central position in a cluster. This option is found in languages, where clitic-like pronouns lack some properties of standard clitics. D) Pure weight principle: light 2P clitics precede heavy 2P clitics. Both particles and other clitics may be light or heavy. E) Mixed weight principle: heavy and light 2P clitics take different slots, but all 2P particles get a uniform treatment. This option might indicate that 2P particles have been inserted into an already existing string of other 2P clitics. 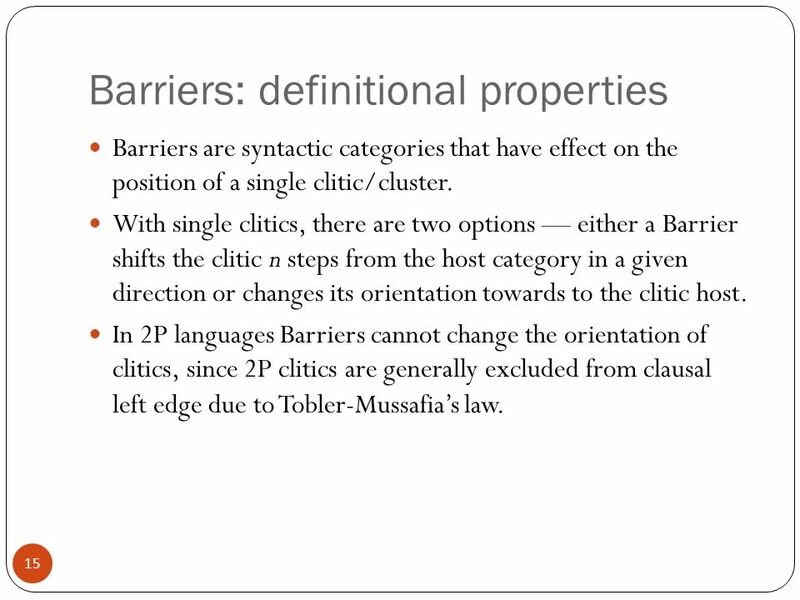 15 15 Barriers: definitional properties Barriers are syntactic categories that have effect on the position of a single clitic/cluster. 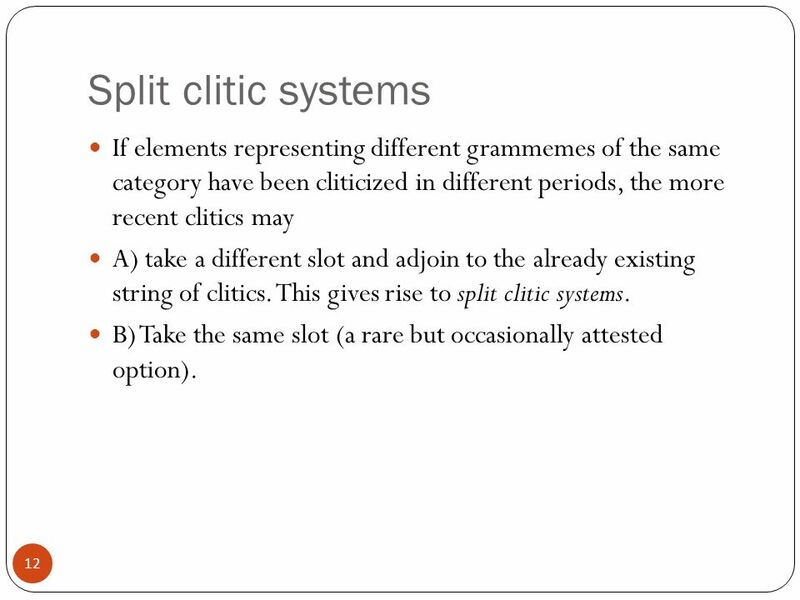 With single clitics, there are two options either a Barrier shifts the clitic n steps from the host category in a given direction or changes its orientation towards to the clitic host. In 2P languages Barriers cannot change the orientation of clitics, since 2P clitics are generally excluded from clausal left edge due to Tobler-Mussafias law. 16 16 Barriers: a parametric approach Languages with Ranking Rule can be parametrized depending on Barrier Rules they use. Our account differs from Zaliznjaks (2008)or Halperns (1996) theories of skipping, since we dont claim that Barriers are necessarily extraclausal and located outside the actual domain where the clitics move. Skipping accounts are falsified by Slavic data. 17 17 Typology of Barriers In 2P languages Barriers cannot change the orientation of clitics, since 2P clitics are generally excluded from clausal left edge due to Tobler-Mussafias law. If one takes into account clusters, there are two options: Barriers can be blind or indiscriminating: in this case they move the whole clitic cluster n steps to the right. 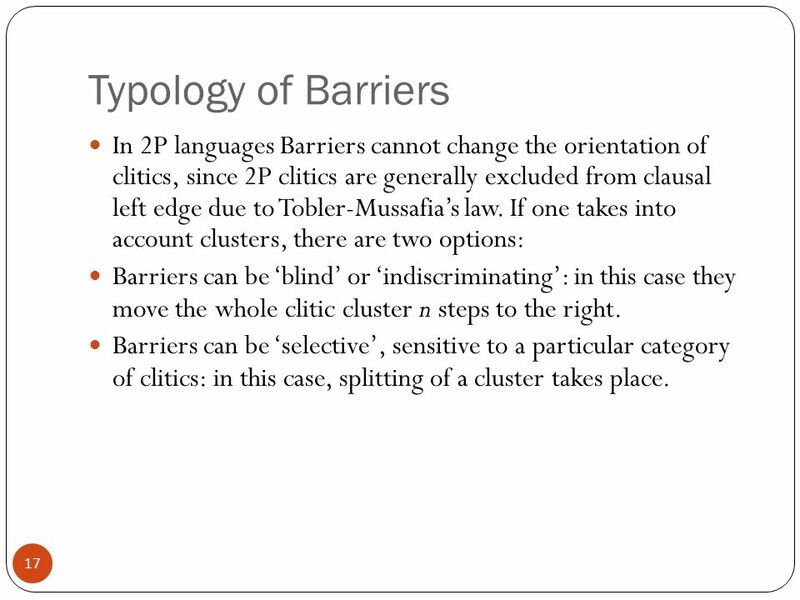 Barriers can be selective, sensitive to a particular category of clitics: in this case, splitting of a cluster takes place. 18 18 Typology of Barriers (2) Obligatory vs optional Barriers. Grammaticalized vs communicative Barriers. Cumulative (two or more Barriers count as a single Barrier) vs undoing Barriers (the second Barrier blocks the effect of the first one). Grammaticalized Barriers are particular lexical heads taking effect on the position of all or some clitics. Communicative Barriers are phrases with a particular communicative status. 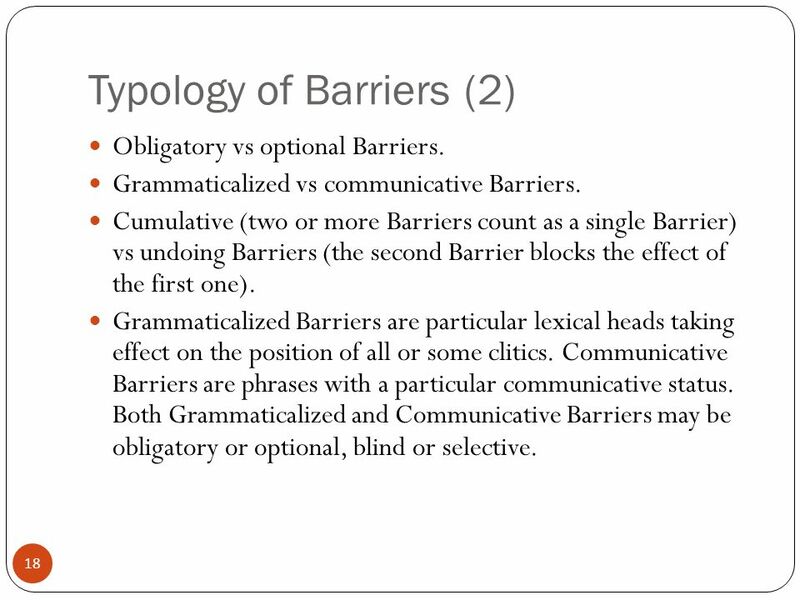 Both Grammaticalized and Communicative Barriers may be obligatory or optional, blind or selective. 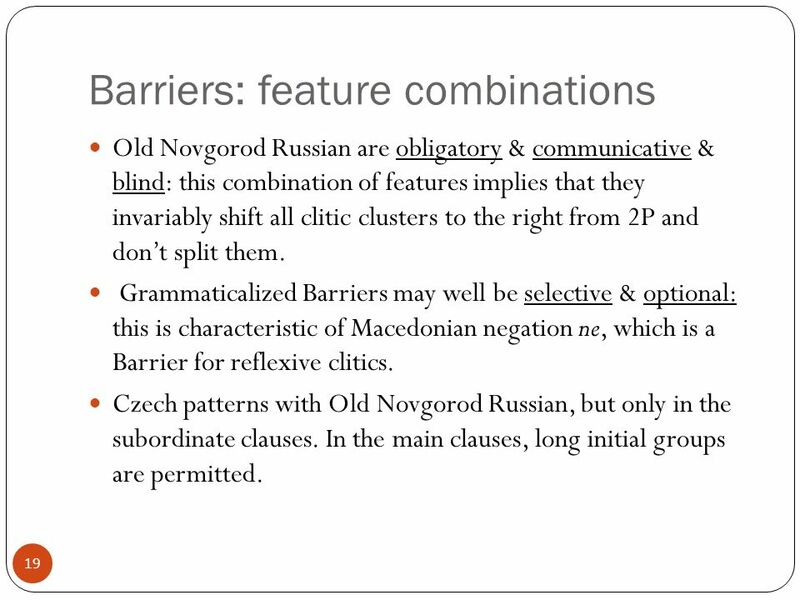 19 19 Barriers: feature combinations Old Novgorod Russian are obligatory & communicative & blind: this combination of features implies that they invariably shift all clitic clusters to the right from 2P and dont split them. Grammaticalized Barriers may well be selective & optional: this is characteristic of Macedonian negation ne, which is a Barrier for reflexive clitics. Czech patterns with Old Novgorod Russian, but only in the subordinate clauses. In the main clauses, long initial groups are permitted. 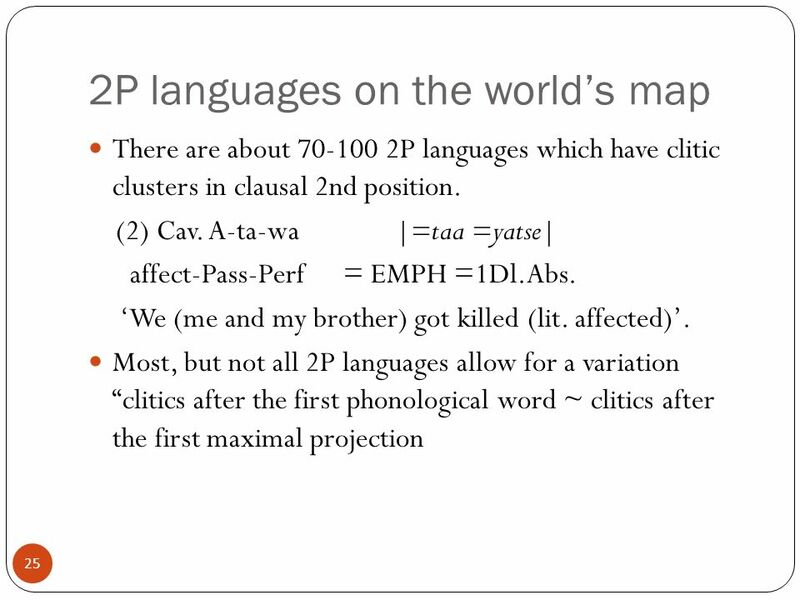 20 20 2P languages In 2P languages clusters take a fixed position to clausal left edge a fact that can be accounted for both in phonetic or in syntactic terms. The boundaries of the class of clitics depend on which approach to defining clitics in UG is taken. Prosodic clitics are elements, which cannot form a phonological word without combining with other words, cf. (Jakobson 1971), (Selkirk 1995). Syntactic clitics are elements, which take syntactic positions that cannot be filled by non-clitic words, cf. (EuroClitics 1999), (Zimmerling 2002: 64). 21 21 Phonetic and syntactic clitics King & Franks (2000) ascribe uniform phonetic features to all clitics in a given language, while genuine prosodic theories take into account that clitics have different phonetic properties, e.g. may be stressed/ lack stress, bear a high tone/ a low tone etc. 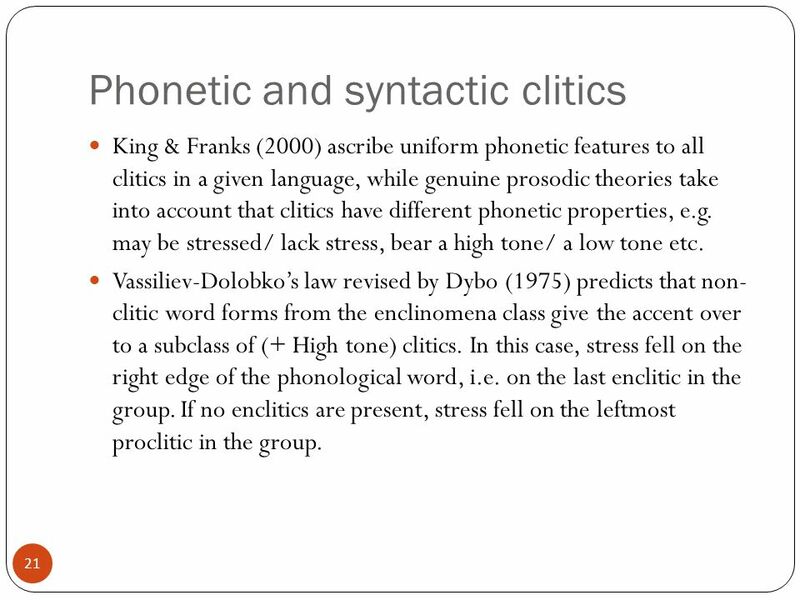 Vassiliev-Dolobkos law revised by Dybo (1975) predicts that non- clitic word forms from the enclinomena class give the accent over to a subclass of (+ High tone) clitics. In this case, stress fell on the right edge of the phonological word, i.e. on the last enclitic in the group. If no enclitics are present, stress fell on the leftmost proclitic in the group. 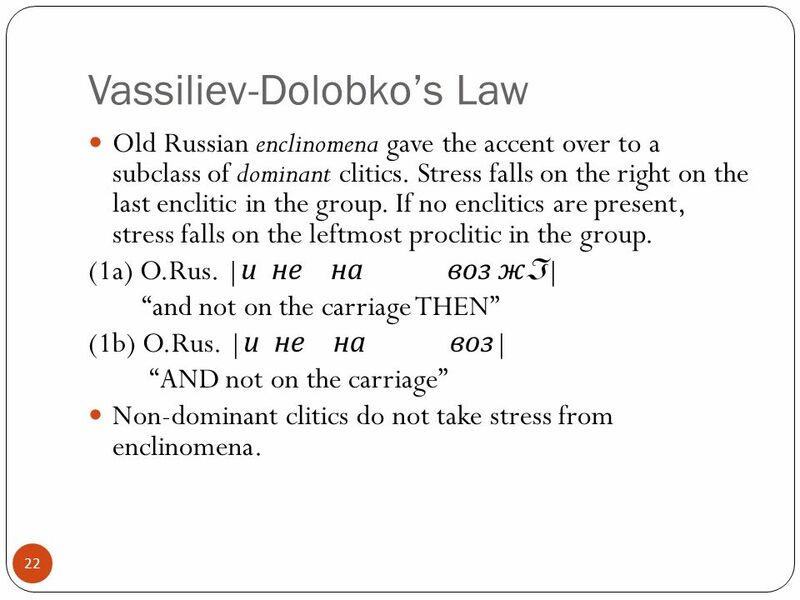 22 22 Vassiliev-Dolobkos Law Old Russian enclinomena gave the accent over to a subclass of dominant clitics. Stress falls on the right on the last enclitic in the group. If no enclitics are present, stress falls on the leftmost proclitic in the group. (1a) O.Rus. | и не на воз ж | and not on the carriage THEN (1b) O.Rus. | и не на воз | AND not on the carriage Non-dominant clitics do not take stress from enclinomena. 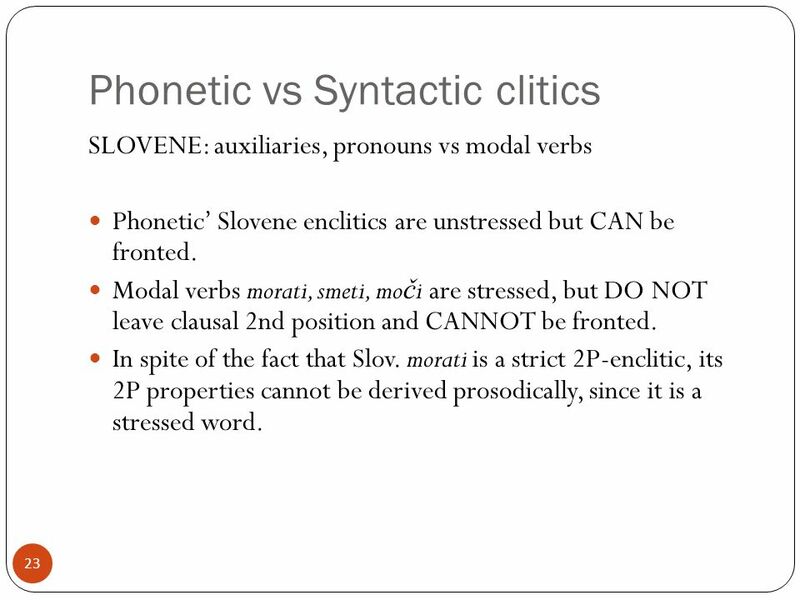 23 23 Phonetic vs Syntactic clitics SLOVENE: auxiliaries, pronouns vs modal verbs Phonetic Slovene enclitics are unstressed but CAN be fronted. Modal verbs morati, smeti, mo č i are stressed, but DO NOT leave clausal 2nd position and CANNOT be fronted. In spite of the fact that Slov. morati is a strict 2P-enclitic, its 2P properties cannot be derived prosodically, since it is a stressed word. 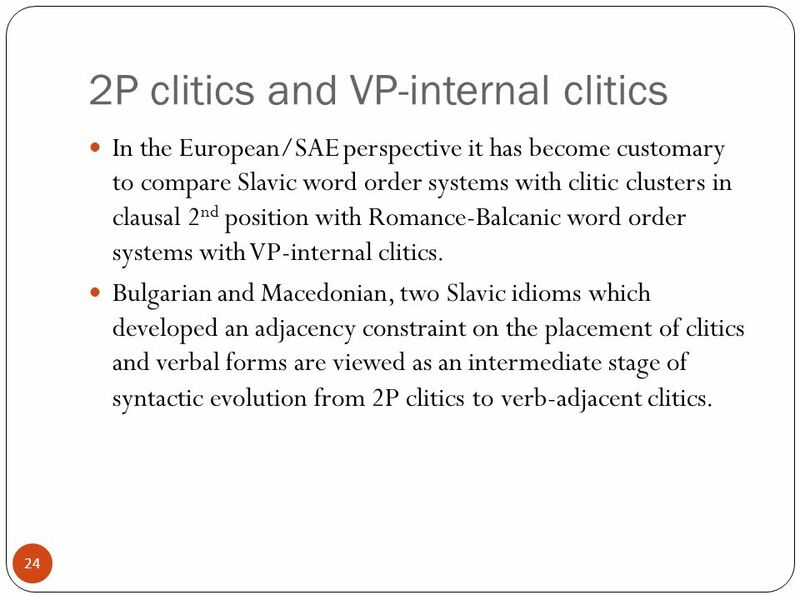 24 24 2P clitics and VP-internal clitics In the European/SAE perspective it has become customary to compare Slavic word order systems with clitic clusters in clausal 2 nd position with Romance-Balcanic word order systems with VP-internal clitics. Bulgarian and Macedonian, two Slavic idioms which developed an adjacency constraint on the placement of clitics and verbal forms are viewed as an intermediate stage of syntactic evolution from 2P clitics to verb-adjacent clitics. 26 26 A sample of 2P languages, I Hittite, Luwian, Old Greek, Old Indian, Old Persian, Avestan, Old Novgorod Russian. Serbian/Croatian/Bosnian, Slovene, Czech, Slovak, Burgenland Croatian, Vojvodina Rusinsky, Carpatian Ukrainian. Pashto, Ossetic (East Iranian). Old Norse, Middle Scandinavian. Bulgarian (South Slavic), Tagalog, Bikol, Cebwano (Central Philippine). 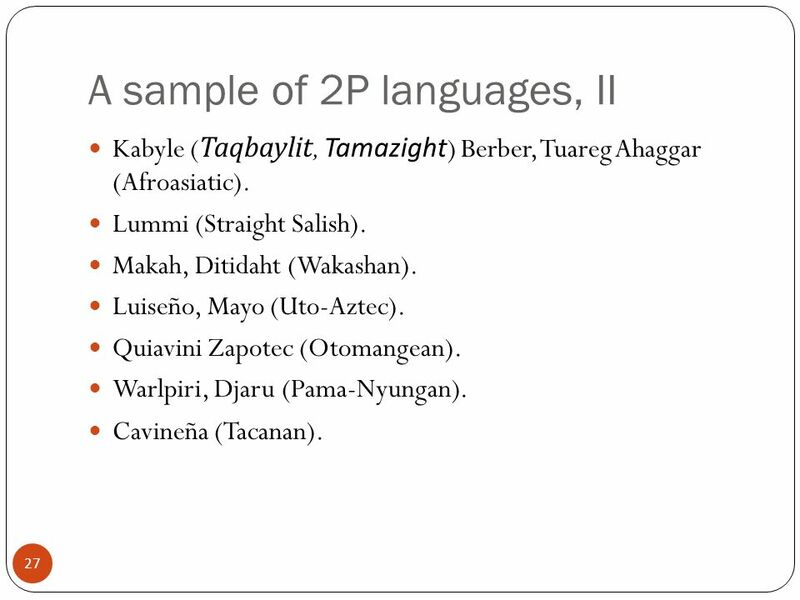 27 27 A sample of 2P languages, II Kabyle (Taqbaylit, Tamazight ) Berber, Tuareg Ahaggar (Afroasiatic). Lummi (Straight Salish). Makah, Ditidaht (Wakashan). Luiseño, Mayo (Uto-Aztec). Quiavini Zapotec (Otomangean). Warlpiri, Djaru (Pama-Nyungan). Cavineña (Tacanan). 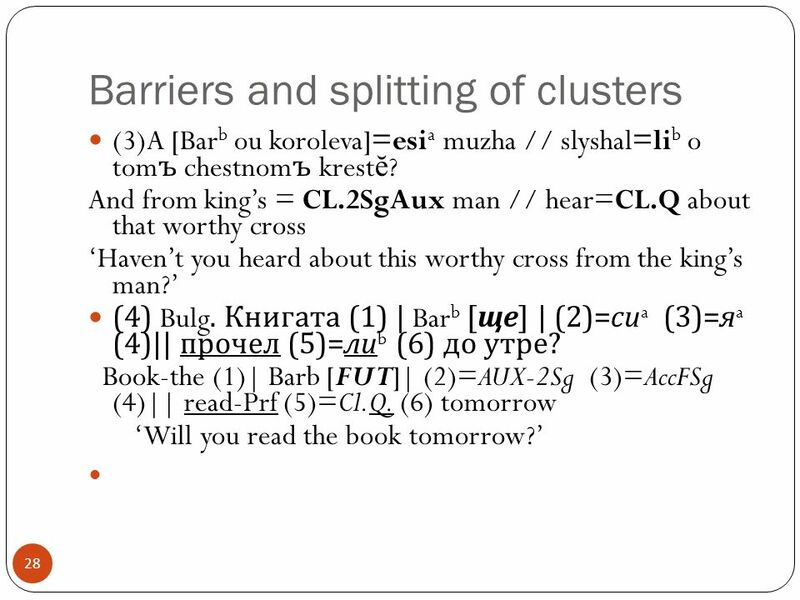 28 28 Barriers and splitting of clusters (3)A [Bar b ou koroleva]=esi a muzha // slyshal=li b o tom ъ chestnom ъ krest ĕ ? And from kings = CL.2SgAux man // hear=CL.Q about that worthy cross Havent you heard about this worthy cross from the kings man? (4) Bulg. Книгата (1) | Bar b [ ще ] | (2)= си a (3)= я a (4)|| прочел (5)= ли b (6) до утре ? Book-the (1)| Barb [FUT]| (2)=AUX-2Sg (3)=AccFSg (4)|| read-Prf (5)=Cl.Q. (6) tomorrow Will you read the book tomorrow? 29 29 TRIVIA (?) The Principle of Domain Shrinking with clitic movement. 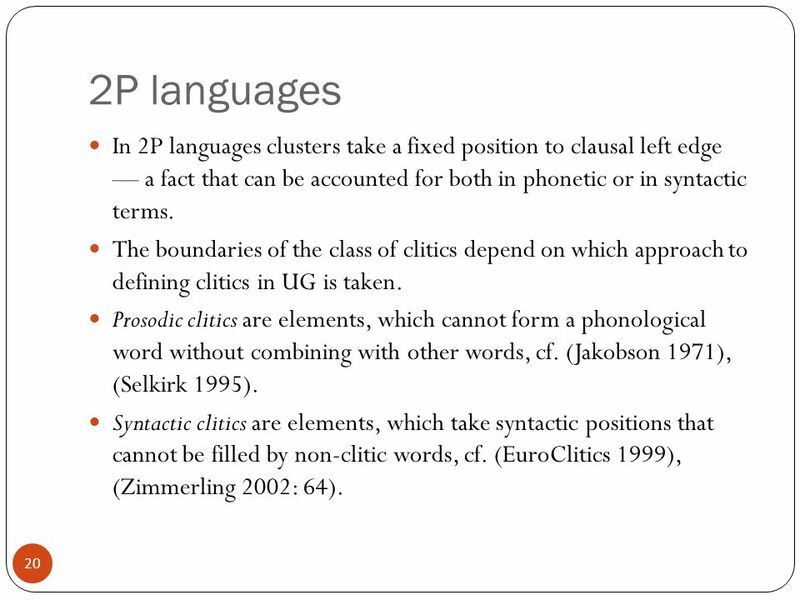 In a vast majority of cases a 2P clitic that leaves its cluster ends up in a contact pre- or postposition to a verbal form. Domain expansion with clitic movement is not attested in 2P languages. 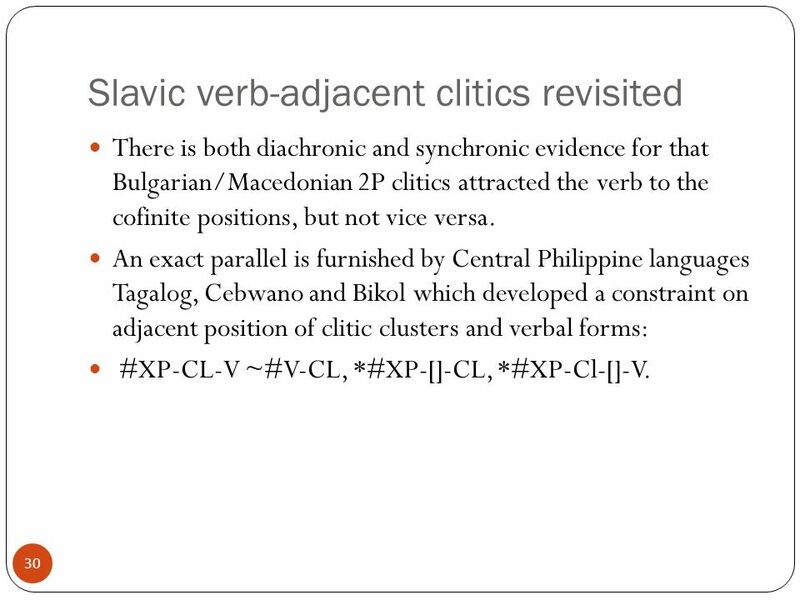 30 30 Slavic verb-adjacent clitics revisited There is both diachronic and synchronic evidence for that Bulgarian/Macedonian 2P clitics attracted the verb to the cofinite positions, but not vice versa. An exact parallel is furnished by Central Philippine languages Tagalog, Cebwano and Bikol which developed a constraint on adjacent position of clitic clusters and verbal forms: #XP-CL-V ~#V-CL, *#XP--CL, *#XP-Cl--V.
31 31 Verb-adjacency and clitic strengh Languages of the Bulgarian/Central Philippine type preserve clitics that dont leave 2P; these languages lack clitic climbing from embedded structures. Languages of the standard 2P type (cf. 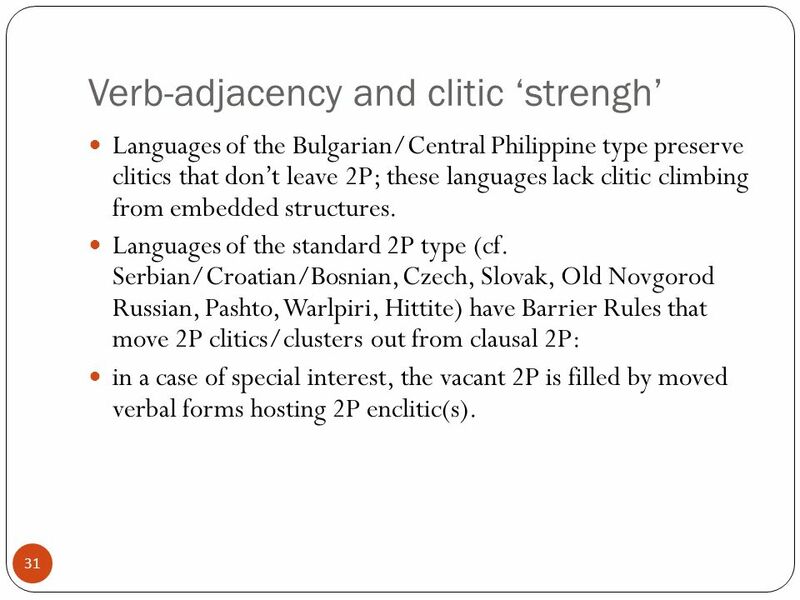 Serbian/Croatian/Bosnian, Czech, Slovak, Old Novgorod Russian, Pashto, Warlpiri, Hittite) have Barrier Rules that move 2P clitics/clusters out from clausal 2P: in a case of special interest, the vacant 2P is filled by moved verbal forms hosting 2P enclitic(s). 32 32 Hypothesis There seems to be a correlation of clitic climbing, Barrier Rules and Verb-Adjacency. 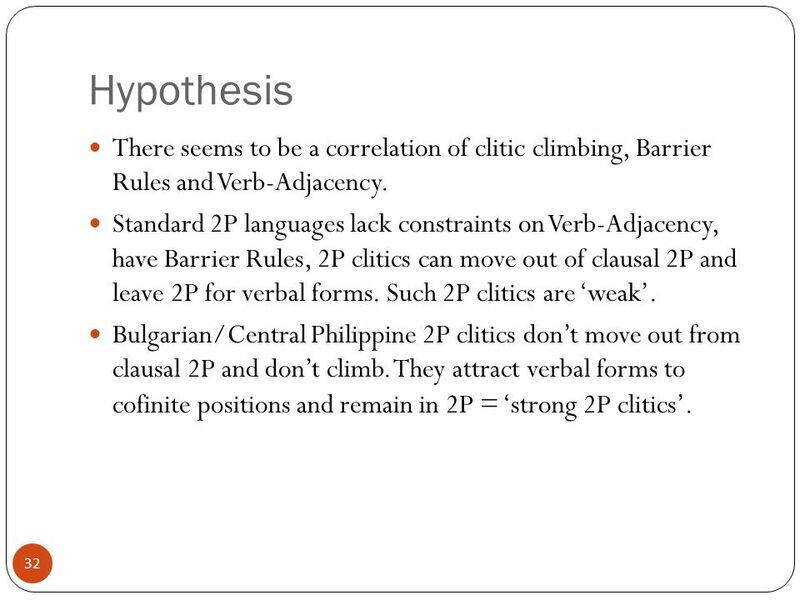 Standard 2P languages lack constraints on Verb-Adjacency, have Barrier Rules, 2P clitics can move out of clausal 2P and leave 2P for verbal forms. Such 2P clitics are weak. Bulgarian/Central Philippine 2P clitics dont move out from clausal 2P and dont climb. They attract verbal forms to cofinite positions and remain in 2P = strong 2P clitics. 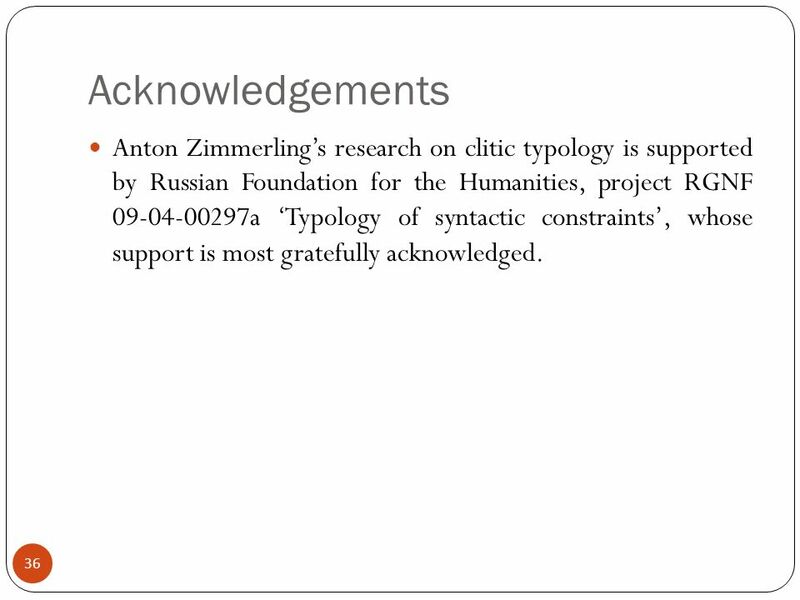 36 36 Acknowledgements Anton Zimmerlings research on clitic typology is supported by Russian Foundation for the Humanities, project RGNF 09-04-00297a Typology of syntactic constraints, whose support is most gratefully acknowledged. 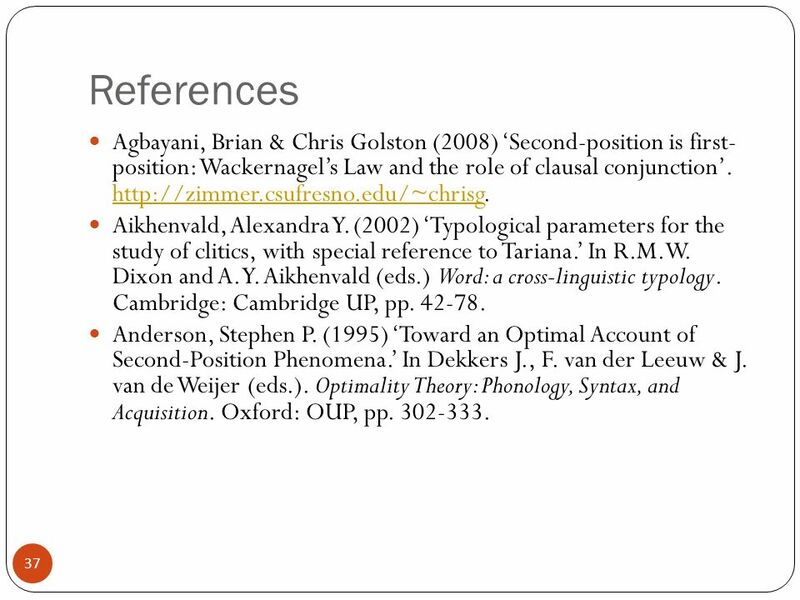 37 37 References Agbayani, Brian & Chris Golston (2008) Second-position is first- position: Wackernagels Law and the role of clausal conjunction. http://zimmer.csufresno.edu/~chrisg. http://zimmer.csufresno.edu/~chrisg Aikhenvald, Alexandra Y. (2002) Typological parameters for the study of clitics, with special reference to Tariana. In R.M.W. Dixon and A. Y. Aikhenvald (eds.) Word: a cross-linguistic typology. Cambridge: Cambridge UP, pp. 42-78. Anderson, Stephen P. (1995) Toward an Optimal Account of Second-Position Phenomena. In Dekkers J., F. van der Leeuw & J. van de Weijer (eds.). Optimality Theory: Phonology, Syntax, and Acquisition. Oxford: OUP, pp. 302-333. 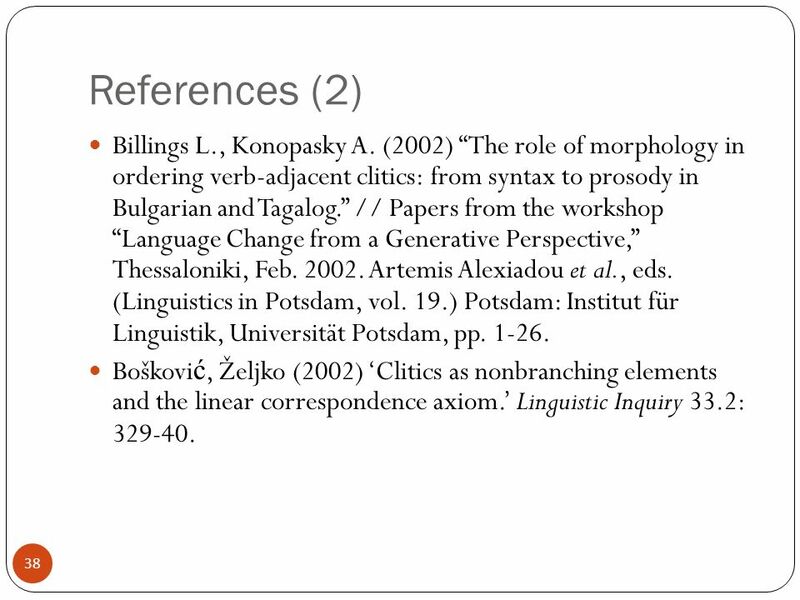 38 38 References (2) Billings L., Konopasky A. (2002) The role of morphology in ordering verb-adjacent clitics: from syntax to prosody in Bulgarian and Tagalog. // Papers from the workshop Language Change from a Generative Perspective, Thessaloniki, Feb. 2002. Artemis Alexiadou et al., eds. (Linguistics in Potsdam, vol. 19.) Potsdam: Institut für Linguistik, Universität Potsdam, pp. 1-26. Boškovi ć, Željko (2002) Clitics as nonbranching elements and the linear correspondence axiom. Linguistic Inquiry 33.2: 329-40. 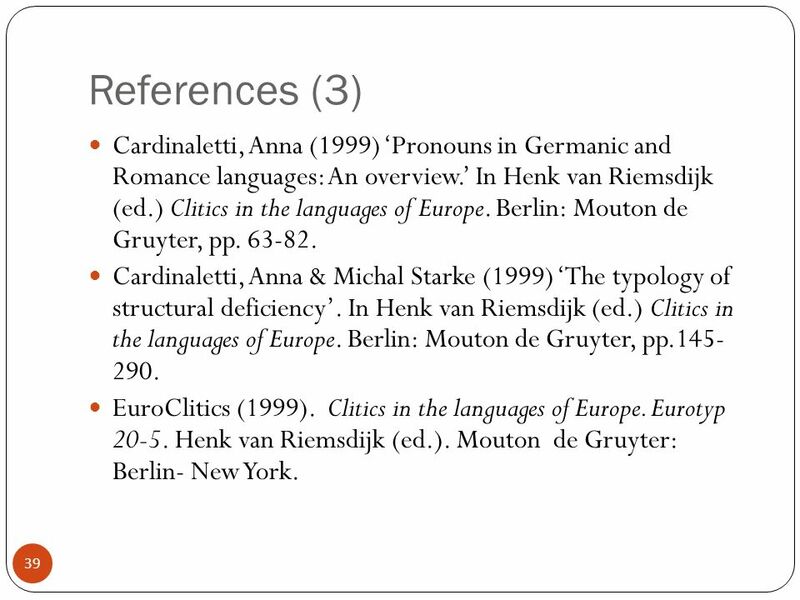 39 39 References (3) Cardinaletti, Anna (1999) Pronouns in Germanic and Romance languages: An overview. In Henk van Riemsdijk (ed.) Clitics in the languages of Europe. Berlin: Mouton de Gruyter, pp. 63-82. Cardinaletti, Anna & Michal Starke (1999) The typology of structural deficiency. In Henk van Riemsdijk (ed.) Clitics in the languages of Europe. Berlin: Mouton de Gruyter, pp.145- 290. EuroClitics (1999). Clitics in the languages of Europe. Eurotyp 20-5. Henk van Riemsdijk (ed.). Mouton de Gruyter: Berlin- New York. 40 40 References (4) Dybo, Wladimir A. (1975) Zakon Vassiljeva-Dolobko v drevnerusskom jazyke na materiale Chudovskogo Zaveta. International journal of linguistics and poetics, vol. 18:1, 7-81. 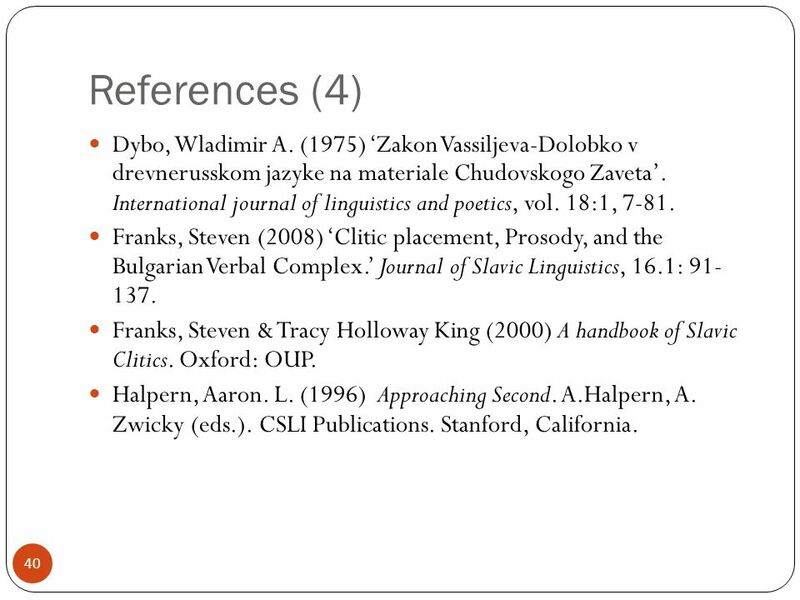 Franks, Steven (2008) Clitic placement, Prosody, and the Bulgarian Verbal Complex. Journal of Slavic Linguistics, 16.1: 91- 137. Franks, Steven & Tracy Holloway King (2000) A handbook of Slavic Clitics. Oxford: OUP. Halpern, Aaron. L. (1996) Approaching Second. A.Halpern, A. Zwicky (eds.). CSLI Publications. Stanford, California. 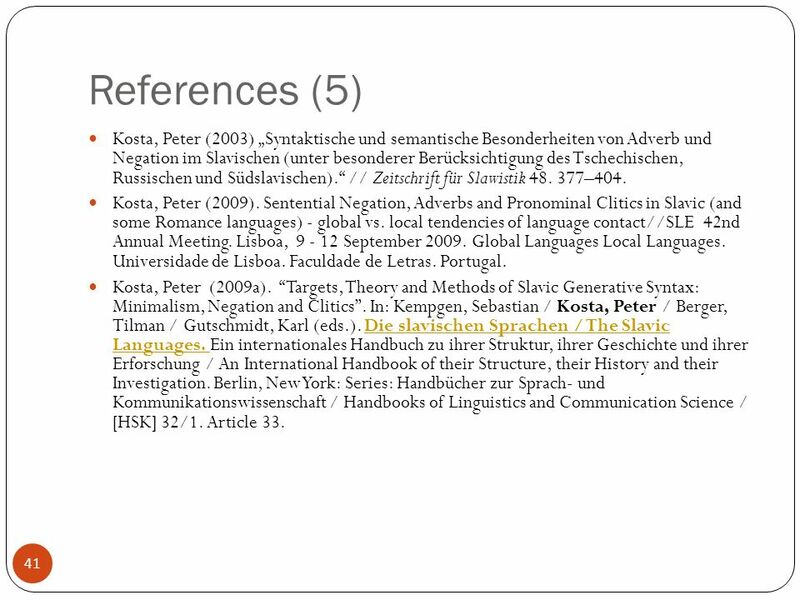 41 41 References (5) Kosta, Peter (2003) Syntaktische und semantische Besonderheiten von Adverb und Negation im Slavischen (unter besonderer Berücksichtigung des Tschechischen, Russischen und Südslavischen). // Zeitschrift für Slawistik 48. 377–404. Kosta, Peter (2009). 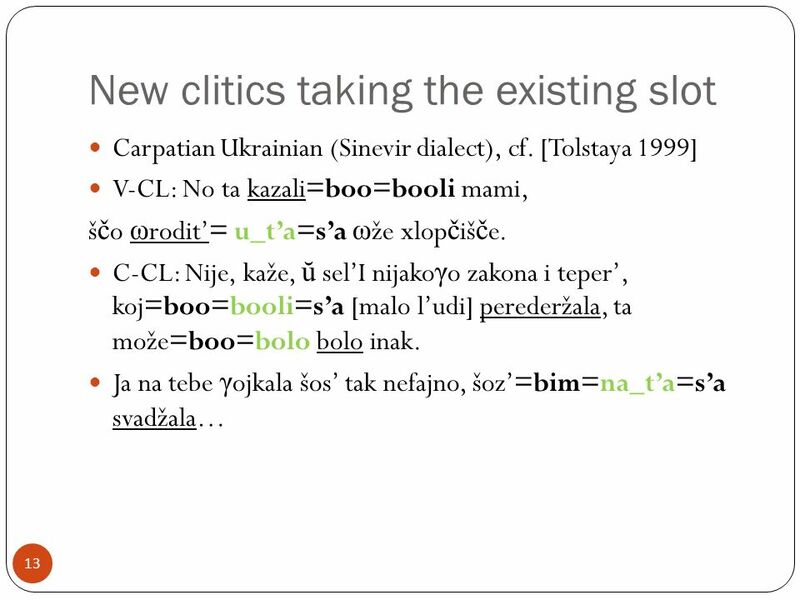 Sentential Negation, Adverbs and Pronominal Clitics in Slavic (and some Romance languages) - global vs. local tendencies of language contact//SLE 42nd Annual Meeting. Lisboa, 9 - 12 September 2009. Global Languages Local Languages. Universidade de Lisboa. Faculdade de Letras. Portugal. Kosta, Peter (2009a). Targets, Theory and Methods of Slavic Generative Syntax: Minimalism, Negation and Clitics. In: Kempgen, Sebastian / Kosta, Peter / Berger, Tilman / Gutschmidt, Karl (eds.). Die slavischen Sprachen / The Slavic Languages. Ein internationales Handbuch zu ihrer Struktur, ihrer Geschichte und ihrer Erforschung / An International Handbook of their Structure, their History and their Investigation. Berlin, New York: Series: Handbücher zur Sprach- und Kommunikationswissenschaft / Handbooks of Linguistics and Communication Science / [HSK] 32/1. Article 33.Die slavischen Sprachen / The Slavic Languages. 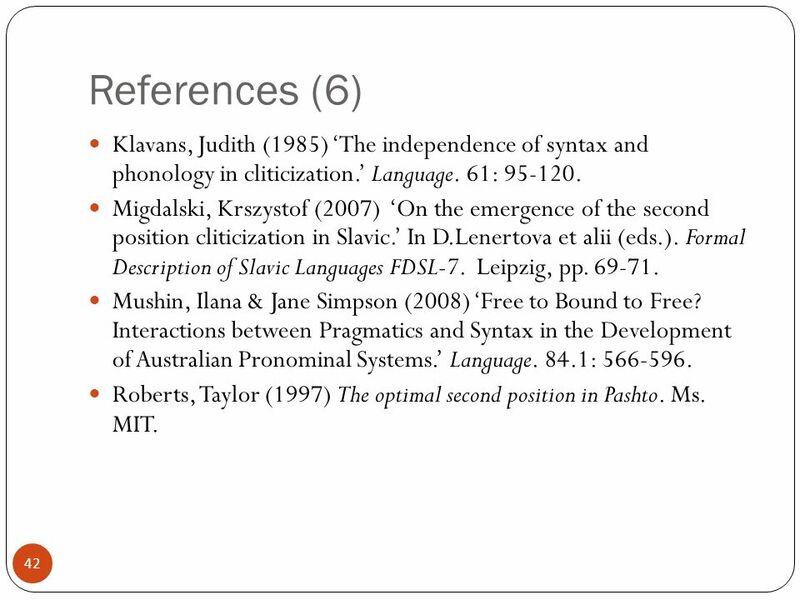 42 42 References (6) Klavans, Judith (1985) The independence of syntax and phonology in cliticization. Language. 61: 95-120. Migdalski, Krszystof (2007) On the emergence of the second position cliticization in Slavic. In D.Lenertova et alii (eds.). Formal Description of Slavic Languages FDSL-7. Leipzig, pp. 69-71. Mushin, Ilana & Jane Simpson (2008) Free to Bound to Free? Interactions between Pragmatics and Syntax in the Development of Australian Pronominal Systems. Language. 84.1: 566-596. Roberts, Taylor (1997) The optimal second position in Pashto. Ms. MIT. 43 43 References (7) Selkirk, Elisabeth (1995). The prosodic structure of function words. In Jill N. Beckman, L. Walsh Dickey, & S. Urbanczyk (eds.) Papers in Optimality Theory. University of Massachusetts Occasional Papers 18. Amherst: University of Massachusetts, pp. 439-470. 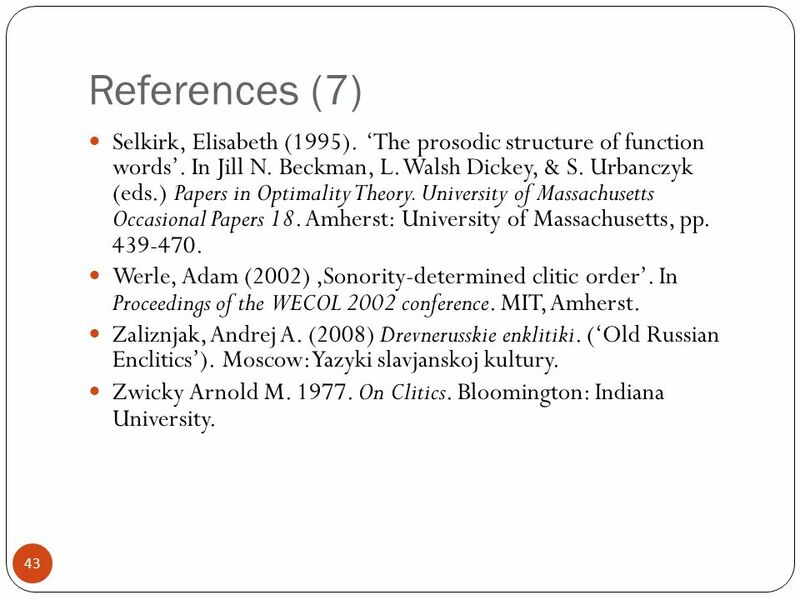 Werle, Adam (2002) Sonority-determined clitic order. In Proceedings of the WECOL 2002 conference. MIT, Amherst. Zaliznjak, Andrej A. (2008) Drevnerusskie enklitiki. (Old Russian Enclitics). Moscow: Yazyki slavjanskoj kultury. Zwicky Arnold M. 1977. On Clitics. Bloomington: Indiana University. 44 44 References (8) Zimmerling, Anton W. (2002). Tipologicheskij sintaksis skandinavskih jazykov. (Typological Scandinavian Syntax). Moscow: Yazyki slavjanskoj kultury. 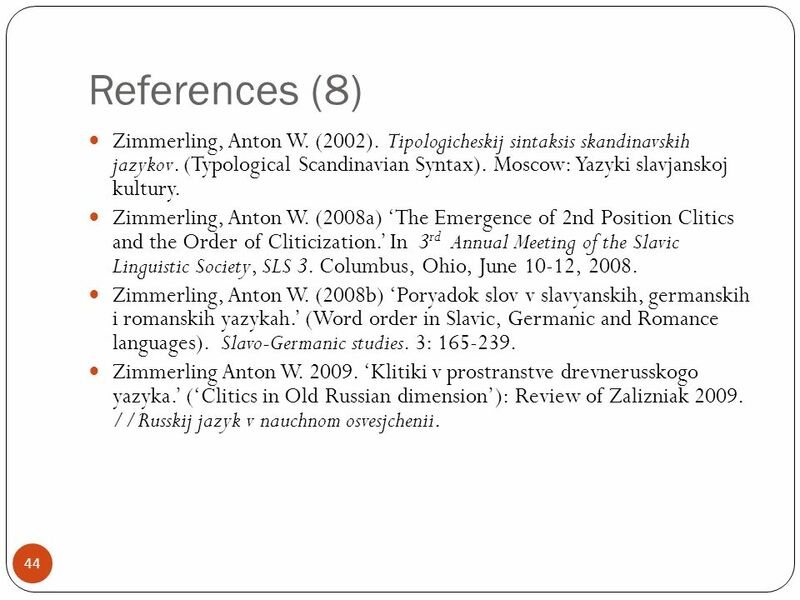 Zimmerling, Anton W. (2008a) The Emergence of 2nd Position Clitics and the Order of Cliticization. In 3 rd Annual Meeting of the Slavic Linguistic Society, SLS 3. Columbus, Ohio, June 10-12, 2008. Zimmerling, Anton W. (2008b) Poryadok slov v slavyanskih, germanskih i romanskih yazykah. (Word order in Slavic, Germanic and Romance languages). Slavo-Germanic studies. 3: 165-239. Zimmerling Anton W. 2009. Klitiki v prostranstve drevnerusskogo yazyka. (Clitics in Old Russian dimension): Review of Zalizniak 2009. //Russkij jazyk v nauchnom osvesjchenii. 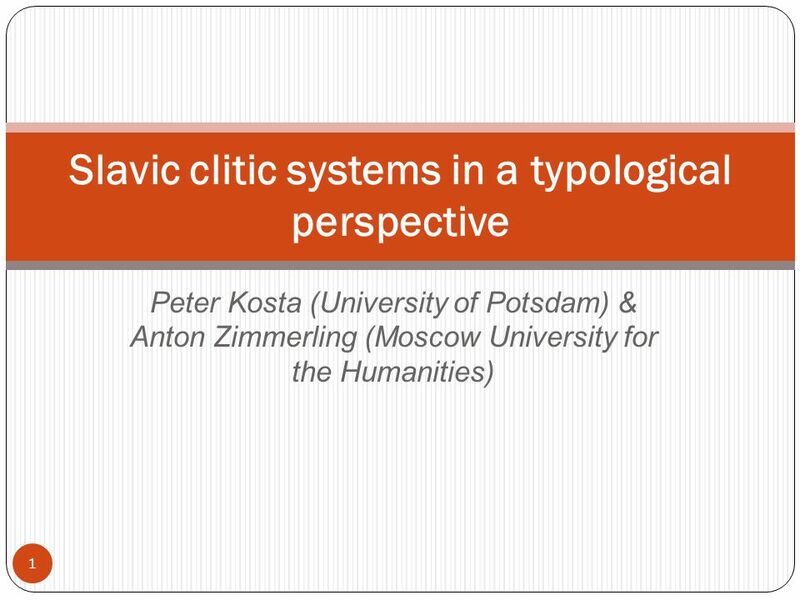 Download ppt "1 Peter Kosta (University of Potsdam) & Anton Zimmerling (Moscow University for the Humanities) Slavic clitic systems in a typological perspective."